The Obamas have Bo and Sunny. George W. Bush's family had Miss Beazley, Barney, and Spot. And, if she's elected president, Carly Fiorina and her husband Frank will bring her two canine companions with them to the White House. So, what are Carly Fiorina's dogs' names? Max and Snickers are the two Yorkshire terriers that live with the Fiorinas. And, in a particularly funny moment in Fiorina's Monday night appearance on The Tonight Show Starring Jimmy Fallon, the former business executive and presidential contender shared an adorable ritual between her and one of her furry companions. Fiorina — still riding the wave of her commanding second debate performance — was relaxed and downright funny in her Tonight Show appearance. Fallon and Fiorina opened by discussing Vladimir Putin, and the Republican shared how she would approach the Russian leader. But then the conversation quickly devolved into major cuteness. This was Fiorina's second appearance on the late-night talk circuit and she's proven to be an entertaining guest, able to handle the quick banter and campaign questions with humor and grace. Back in May, Fiorina appeared on Late Night With Seth Myers and did an impressive job handling Myers's questions about slip-ups in her campaign, which had just gotten underway. The former Hewlett-Packard CEO vaulted to second place in the polls after her strong performance in last week's Republican debate. While Trump is still the front-runner, CNN's recent polls showed that his support slipped from 32 percent to 24 percent. 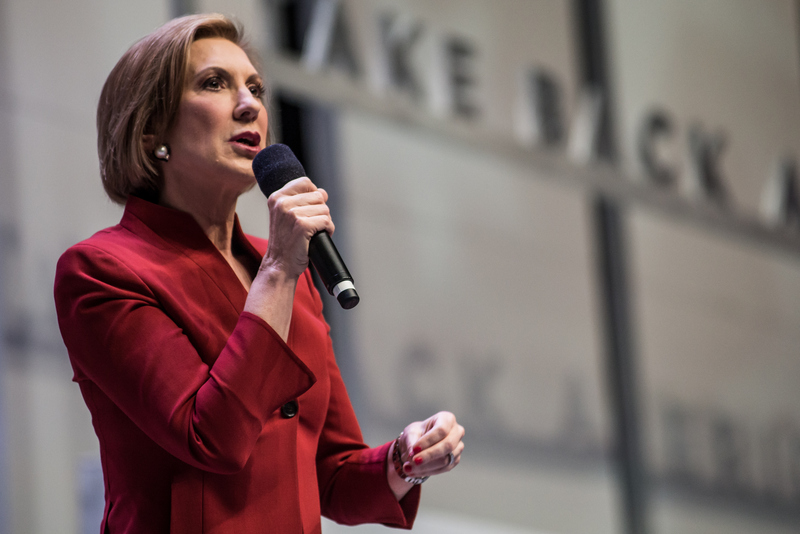 Fiorina leaped from 3 percent in early September to 15 percent following the second Republican debate.